Indianapolis-based general contractor Victory Unlimited Construction LLC in May 2014 began work on a warehouse for Preferred Freezer Services, a nationwide provider of frozen storage and logistics services for the food industry. The facility is the client’s first in the state of Washington. Victory hired none other than SunSteel to assist with the fabrication and erection of the loading dock, office, mezzanines and mechanical support spaces. This one-of-a-kind warehouse is now the largest public refrigerated warehouse in North America and the largest single cold storage facility ever built at one time anywhere in the world! 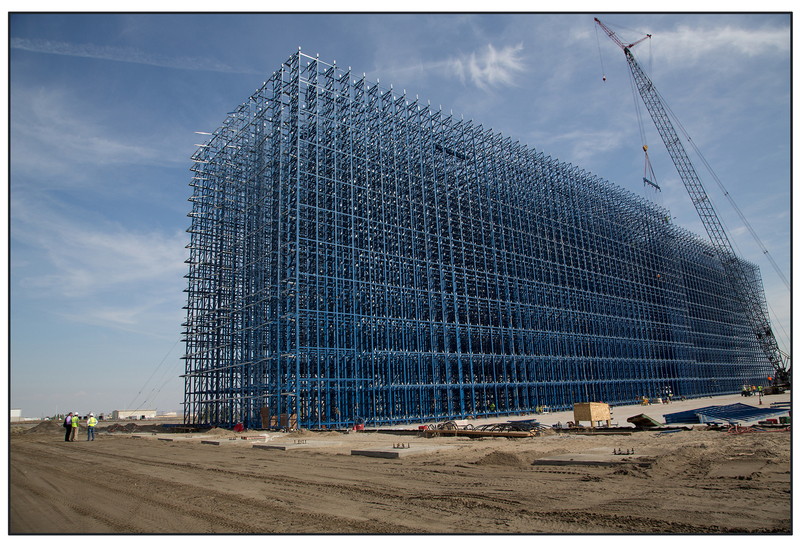 The 116-foot-tall building will offer 117,000 total pallet storage positions, with vertical storage of 11 pallet positions. Each freezer will be fully automated and will feature conveyors, specialized cranes – known as storage and retrieval machines – and pallet moles rather than human-operated equipment typically used in warehouses. The automation system was designed and installed by DEMATIC.